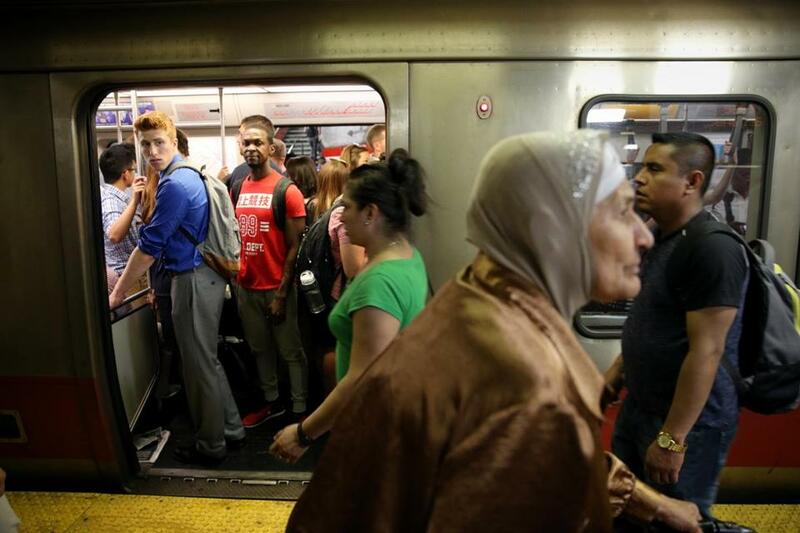 Commuters board a train on the MBTA Red Line at Park Street Station in Boston. In an election year, even the most popular governor in America is apparently afraid to cross the MBTA’s powerful labor unions. That probably explains why Republican Governor Charlie Baker took a pass on trying to extend a three-year waiver of the Pacheco law, a reform that allowed the T to save money by freely outsourcing work to private contractors. Instead, the governor let the waiver quietly lapse, as of July 1. As a result, T management must return to a complicated procedure mandated by the union-friendly law, which is designed, first, to protect public sector jobs by making it harder to privatize. The law was named after state Senator Marc Pacheco, a Democrat from Taunton, who championed it back in 1993. At the time, it was strongly opposed by Republican Governor Bill Weld, for whom Baker worked as secretary of administration and finance. Weld, whose privatization agenda enraged T workers, vetoed the bill even as he prepared to run for reelection. But Democrats, who controlled the Legislature then as they do now, overturned his veto. The Pachecho law withstood efforts to reform it until 2015, when Baker took office and a series of monster snowstorms shut down transit service. Empowered by public outrage over the transit crisis, Baker convinced the Legislature to grant the T a three-year exemption from the law. Last year, the T reported that it expected to save $400 million in operating and capital expenses, thanks to the waiver. According to Commonwealth magazine, a report on the waiver impact also said privitization forced the T’s largest union — Boston Carmen’s Local 589 — to negotiate changes in workplace rules and wage concessions. “The Pacheco waiver has been a huge win for taxpayers and riders,” said Brian Shortsleeve, who served as the T’s acting general manager and is now a member of the T’s Fiscal and Management Control Board. Yet Baker filed no legislation to extend that victory. Politically, it would have been difficult to win another exemption. But Baker’s surrender without a peep is another illustration of his cautious approach to governing. By now he should also know appeasement doesn’t work: Local 589 just filed a lawsuit that accuses the transit agency of payroll mistakes. Besides, when it comes to challenging labor, history is on Baker’s side. Despite enraging unions, Weld won reelection in 1994, with 70 percent of the vote. Baker, who also seems headed for a comfortable win in November, should take up the Pacheco waiver cause again. He certainly will have political capital. All he needs is courage.